Happy Friday gang! This week has just about been too much. But I see the light at the end of tunnel! It’s almost the weekend. WOOT!! So I thought since I’ve been to busy to post, I would give you a quickly rundown of my week! This morning started bright and early with me subbing a Jazzercise class. This was the 3rd morning class I’ve subbed this week for some vacationing instructors. I’ll end my weekly teaching schedule tonight after work with my 9th class of the week. Whew! Exhausted much? Yes. I was lucky enough to still have Wednesday off from teaching, so I was able to squeeze in my weekly ‘kinda long’ run. This was also an extremely windy morning. Like wind gusts up to 30 mph. 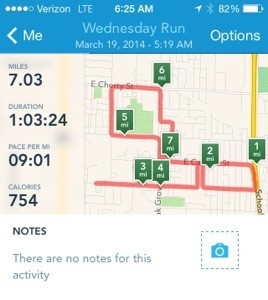 I was pretty beaten and torn down by the time that 7 miles was up. Regardless, I was still happy to fit it into my busy schedule! 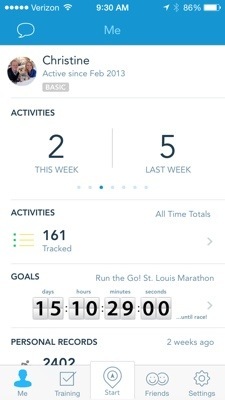 My lovely RunKeeper app also reminded me that my marathon is a mere 15 days away! Slightly frightening? You betcha. Especially after this week when I only had 1 normal day of running. But I should get kinda back on track this weekend. Plus with one marathon under my belt, the anxiety is definitely lower for this next one. And that’s about it! Now this weekend should be equal parts exciting and lazy. Tomorrow morning is going to start bright and early for me to log some miles before I head off to the Pitter Pat 10K. So here’s the lowdown: this race wasn’t on my training schedule. But it’s put on by the local Junior League, and Katie (owner of my Jazzercise center) is part of this organization. We were asked to do the warm up for the runners pre-race, so obviously I couldn’t pass up this opportunity to lead my fellow runners in some Jazzercise! And I felt really silly to not sign up for the race since I would already be there. Sooooo this fun 10K was added to my schedule last minute. And I’m pretty excited about it! The rest of my Saturday should be low key, followed by a typical Sunday without any major plans. I’m excited to be lazy and maybe have a real date night with Mr. Nicholas! We’ve been complete couch potatoes lately, so I think we deserve a nice dinner and movie evening. I hope you all have had great weeks! Enjoy your weekend, and I’ll talk to you later! Happy Tuesday! It’s a sunshiny day here in SGF, and I’m loving it! Our 7 day forecast is also showing highs in the upper-50’s, so that makes me extra happy. Fifty degrees + lots of sunshine = clear sidewalks for me to run on. Yay! Last night when I got home, I had a special delivery waiting for me on my doorstep! 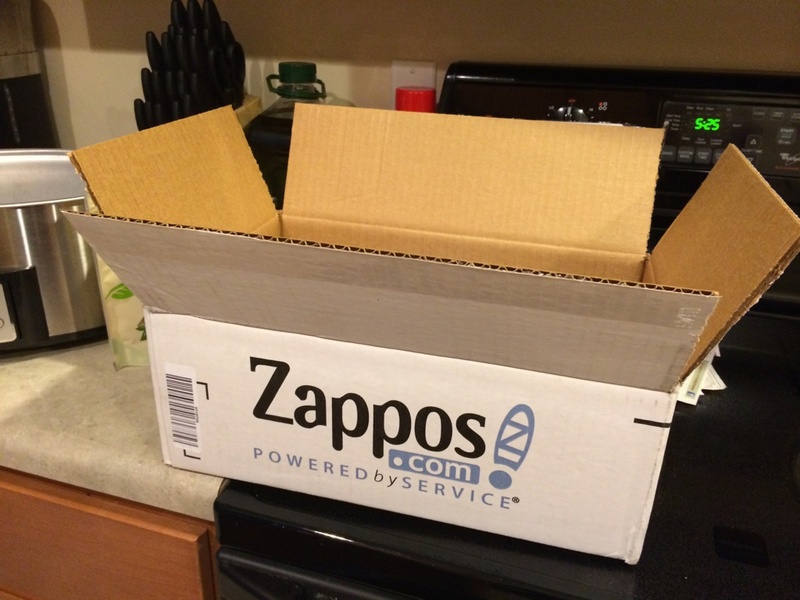 My shoes had arrived from Zappos!! 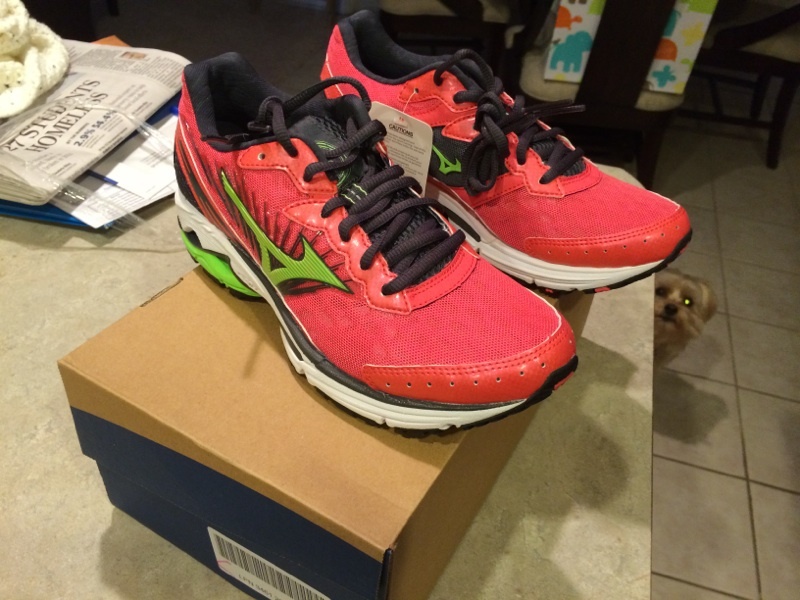 I of course immediately ripped open the box to dig out my new running shoes. And they were so pretty – just as I had imagined. 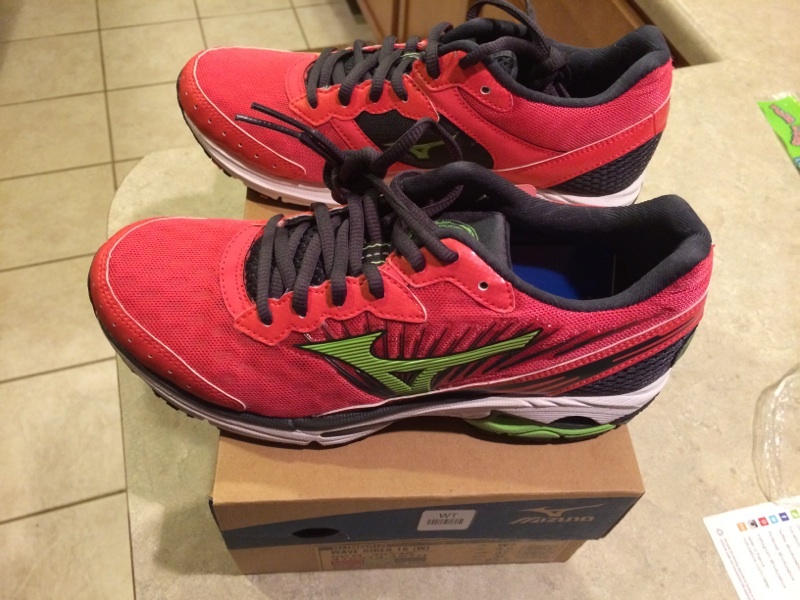 I decided to go with the Mizuno Wave Rider 16 running shoes in this pretty rose color. It’s not quite red and not quite pink. I kinda like it! 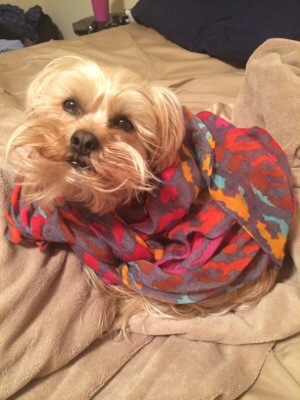 Bonus points to the first person to spot the doggie in this picture! HA! Mac is always so curious. Since I was subbing 6:45 Jazzercise last night, I decided I would try out these shoes on the dance floor first since my next couple of runs are bound to be a little slushy and salty still from the melting snow. I’m definitely not taking my brand new shoes out until the streets have dried up completely! I’m happy to report that they fit great and felt extra light and springy while I taught class last night. They offer lots of arch support and had a lot of extra room in the toe bed. This isn’t necessarily ideal for Jazzercise shoes, but it’s perfect for shoes that I will most likely be wearing in my upcoming races. 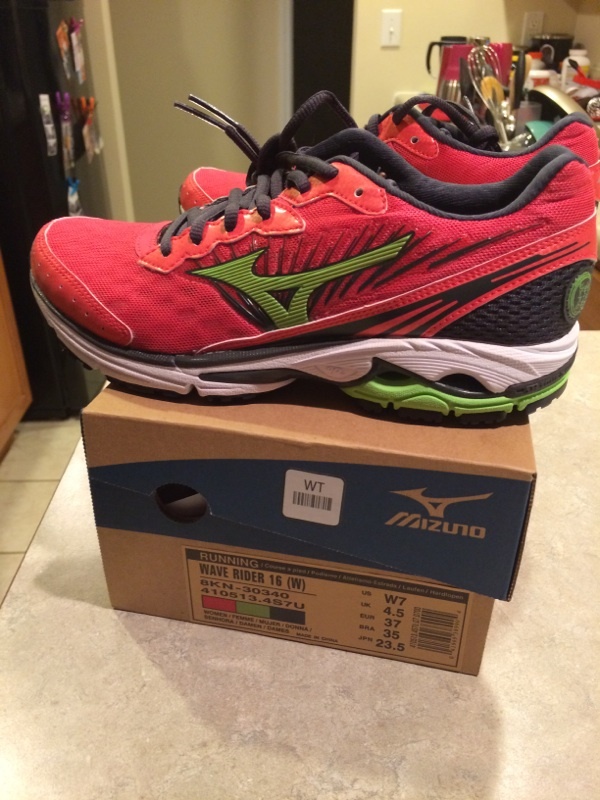 My toes will appreciate the extra space and the mesh venting across the top during the 26.2! So far, I give them 2 thumbs up! And speaking of upcoming races, I got a little trigger happy and registered for another race last night. Well I’m off to change up my song set for this evening. I need some fresh tunes! I hope you have a wonderful evening – see ya later! Hey everyone! I hope you are enjoying the weekend. The weather has gone from rainy to snowy here, but it’s nothing us Missourians can’t handle! Yesterday morning started with my long run. I peeked out my window to see if the rain was too much to handle. It looked barely drizzly, so I bundled up in my normal running attire + my running rain jacket. I was determined to get this 20-miler out of the way if at all possible! The first 4 miles were terrible. I really thought I was going to turn around and go home. It almost immediately started raining a little harder when I stepped outside, and the 40 degree temps made the rain pretty miserable! By the time I made my first 4 mile loop (my usual starting point), the sun was starting to come up and it made me hopeful the rain would pass. Well I was wrong. It didn’t pass. 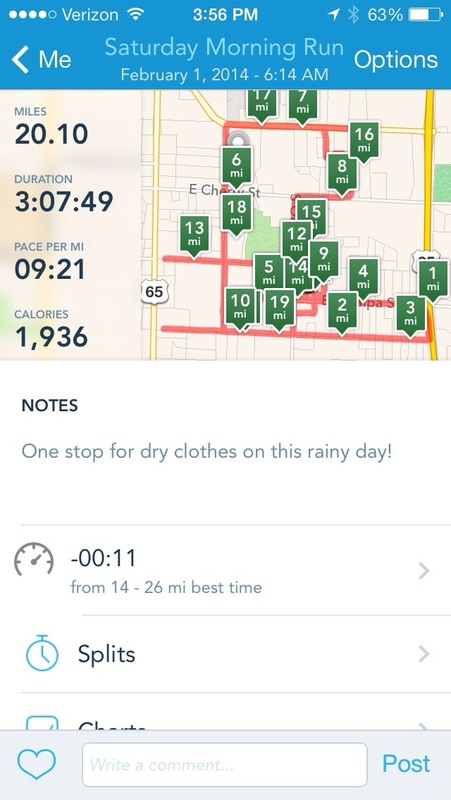 And I ran in the drizzle with spurts of heavier rain for over 3 hours. 3 freakin’ hours. Holy moly. I stopped at 14 miles, or around the 2 hour mark, for a pit stop and a change of dry clothes. I didn’t realize how wet I was until I changed. My running tights were dripping like I had just jumped in a pool! The dry clothes felt amazing and it made my last hour and 6 miles much more manageable. I was tired and my mind was hazy, but my booty was dry and that’s what I needed at the time! Mile 18-20 were my fastest on my splits, and I chalk this up to my pit stop. This run was painful and mentally challenging. But it makes me so hopeful that I can make it through my marathon without a hitch. Usually people hit ‘the wall’ right around mile 20, but if I keep up my water and fueling, I know I can do it! Bring it on, Little Rock!! After those 20 miles, I was obviously a little low on calories for the day. I only had Gu’s and water in my tummy. Nick was sweet enough to take me out for a nice lunch (where I ate a burger the size of my face!). When we arrived home, I was still hungry and needed sugar. 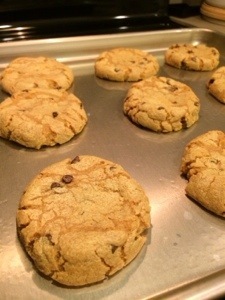 Peanut butter cookies were calling my name! Yum!! And so simple. 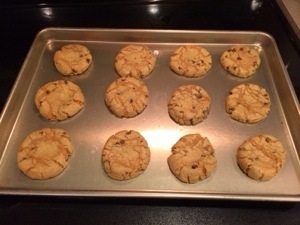 I combined 2 cups creamy, reduced fat peanut butter, 2 cups sugar, 2 eggs, and a large handful of mini chocolate chips to make these babies. Easy peasy! I’ve eaten over half of these babies and even took a few to Jazzercise this morning. My students didn’t mind! And speaking of Jazzercise, I put together a Super Bowl themed song set for this morning’s class to put everyone in the mood for the big game tonight. The songs ranged from Bruno Mars classics (tonight’s halftime performer! ), to songs that seem appropriate for a pep rally, to songs that include moves that are footballesque. Some of my favorites from this morning included Push and Shove by No Doubt, Work hard Play Hard by David Guetta, Work Work by Britney Spears, and Undefeated by Jason Derulo. It was a fun class! I tried to make every song somewhat relatable to the game tonight. I’m not a football fan, but themed class sets always make things more fun. We may have to keep the football set going all week! The evening classes today combined for a Jazzercise Plus class at 1 pm. Jazzercise Plus is a 90 minute class usually used for special occasions. It looks like those ladies had a great time! If my quads would have allowed it, I would have gone for an extra workout today. My legs just cannot stand the thought of getting off this couch after my 20 miles though! After my class this morning, I rushed around to get some groceries before the snow started. 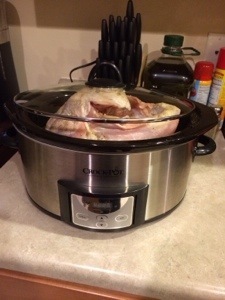 I also wanted to get this baby in the Crockpot. 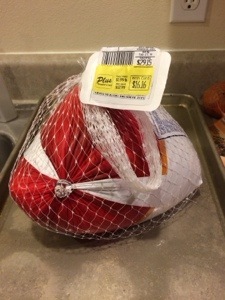 This 8 pound turkey breast caused me some grief this morning, but I’m happy to say that it is now cooperating. I couldn’t get the lid to fit. My turkey was too big! 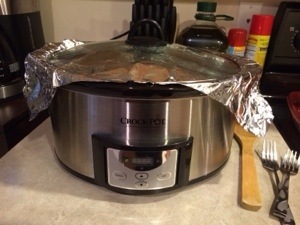 I covered it up with foil the best I could, but I was happy this afternoon when it finally cooked down enough to let the lid sit all the way down like it should. 🙂 We’re going to have quite the little Super Bowl feast tonight! I can’t wait! And FYI, it’s no special occasion for the turkey. I just decided to cook it since it’s been taking up precious real estate in my tiny freezer for over 2 months now! Have a great night everyone! Enjoy the game and some chips and queso. It’s just not the Super Bowl without some unhealthy snacks. See ya later!